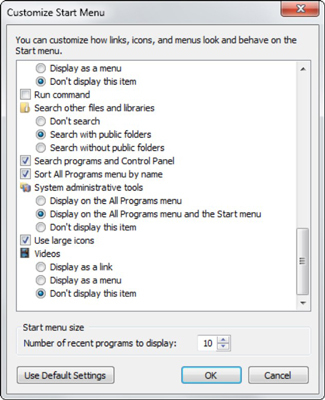 In Windows 7, you can also use the Start Menu to begin a search. When you type a keyword, the search engine will scour your computer looking for files. The Start Menu Search is effective on its own, but you can also change the way the Start Search bar behaves to customize the kinds of results it will find. Right-click the Start button and choose Properties. Windows 7 shows you the Taskbar and Start Menu Properties dialog box. At the top, next to the Start Menu label, click the Customize button. Windows 7 shows you the Customize Start Menu dialog box. Choose Don’t search: The Search bar no longer appears above the Start button. Choose Search with (or without) public folders: Include (or exclude) the folders under the Public folder in the search results. If you don’t want access the items in your public folders from the Start menu, choosing Search without Public Folders will make the searches faster. Choose Search programs and Control Panel: Includes all the programs and applications on your computer in the search results. Your changes take effect immediately. When you type in the Start Search bar and press Enter, Windows 7 will only look for items in the locations you told it to look. The fewer places it looks the faster the search. But it might not always be able to find what you’re looking for. In which case, you’d need to open a Windows Explorer screen to do a thorough search. Note that these changes to the Start Menu Properties dialog box affect only the way the Start menu Search bar acts. Changes here have no effect on other kinds of search in Windows 7.